Palma, with its wonderful shops, art, architecture, food and beaches, is right up my street. More and more people are going to Mallorca specifically for a weekend break in the capital, particularly outside peak season. I’m definitely going to try to nip over in January when the sales start. Well, the island does have a great shoe-making tradition… Anyway, if you are going to go, there is now a tourism card, which should make things a bit easier and cheaper. The Palma Pass costs €34 for two days or €41 for three days. – 10 journeys on city buses plus a return trip on the airport bus. To give you an idea of value for money, the normal bus fare is €1.50 and a 10-ride tourist ticket costs €10. The airport bus costs €3 single. 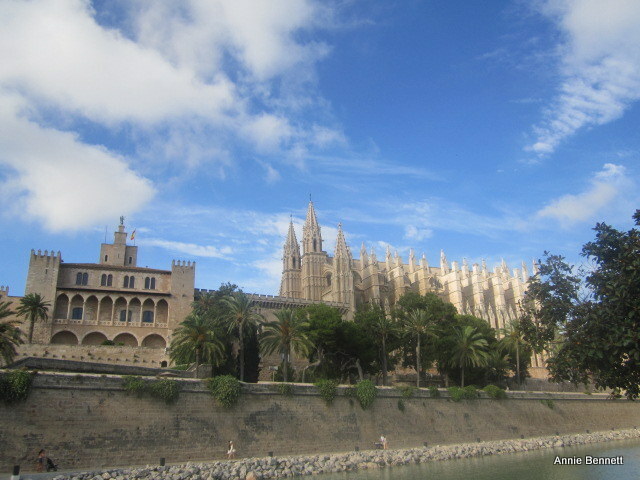 Palma is pretty walkable and you would be unlikely to take the bus 10 times in a couple of days if you are staying in the centre, but you do need the bus to get to the Joan Miró Foundation, Bellver Castle and some other sights, and to get around the Bay of Palma. – Free entry to the Cathedral, Palacio Real de la Almudaina, Es Baluard contemporary art museum, Joan Miró Foundation and Bellver Castle (which is the municipal history museum). Admission is around €6 to these sights if you just pay normally. – Up to 30% discount in some restaurants and shops, on guided tours, the city sightseeing bus, bike and segway hire and various other things, as well as freebies such as t-shirts at some attractions. So, to give a rough example of how to make it worthwhile, you would need to use the airport bus, take four or five other bus rides, go to at least three major sights or museums and take advantage of a few of the discounts. I think if you had three days to explore the city you would easily get your money’s worth for €41, but the two-day pass at €34 probably wouldn’t work out cheaper if you were spending a lot of your time browsing around the shops, visiting the various free cultural centres or just walking along the promenade or around the marinas. Of course, it does make things simpler if you can just flash your pass rather than having to fiddle about finding change. The card is available online from Palma Pass or Neo Experience. In Palma, you can buy it at tourist offices, the Cathedral or the San Francisco Basilica. See Passion for Palma for more information about the city. A weekend break in the sun. I could do with one of those.